A new piece of equipment helped the KC Streetcar run without disruption during this week’s winter ice and sleet storm. This season, the streetcar added an ice scraper to the pantograph, or framework that connects the top of the car to the overhead electric wire. The scraper prevents ice from building up on the wire, allowing electricity to continue powering the streetcar on the track. KANSAS CITY, Mo. — A new piece of equipment helped the KC Streetcar run without disruption during this week’s winter ice and sleet storm. This season, the streetcar added an ice scraper to the pantograph, or framework that connects the top of the car to the overhead electric wire. The scraper prevents ice from building up on the wire, allowing electricity to continue powering the streetcar on the track. So far this year the streetcar has not suspended service due to weather, and only lost a few hours in November and December of 2018. In previous winters, ice had shut down operations for up to half a day, a spokesperson said. While the ice scraper takes care of the electric lines, a different tool clears the tracks. A vehicle with a brush instead of the traditional plow sweeps snow, ice and debris off the trackway. The public chose to name the vehicle Brushy McBrushface. This is the second winter the streetcar has used Brushy. 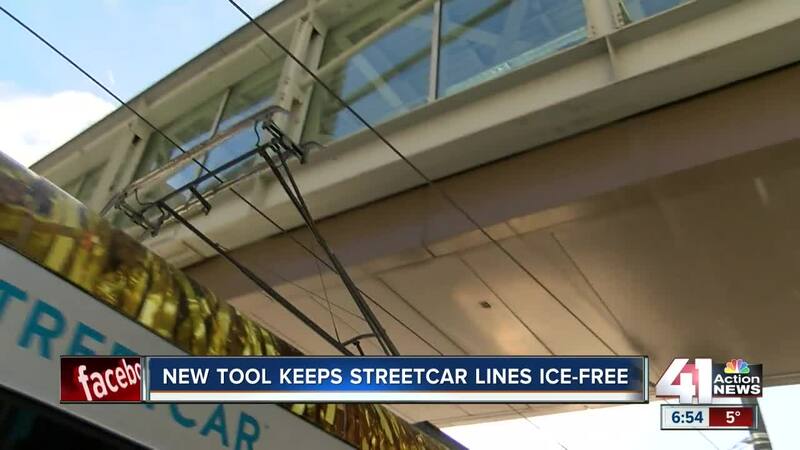 A spokesperson said in rare occasions, crews must manually pick ice out of grooves along the tracks to keep the streetcar operational.